550+ Hour target-based program with 24*7 available learning-resource and dedicated doubt sessions for better learning experience and Best infrastructure. A very flexible program as per different need of the aspirants with option of changing the class frequency. PLAY- Any-where, Any-device, Any-time. Classroom recorded videos. Organised in a way to make your preparation easy, with well researched and in-house developed printed books. Best way to keep tab on your progress and test your temperament even before real time exam. Power packed 30 Days program for quick brush up the syllabus and concept to crack the exam. 350+ Hour target-based program with 24*7 available learning-resource and dedicated doubt sessions for better learning experience and Best infrastructure. A very flexible program as per different need of the aspirantswith option of changing the class frequency. PLAY- Any-where, Any-device, Any-time. Classroom recorded videos. Best options for the students preparing at home. 45 Days capsule program for quick concept building and doubt clearance, to crack the exam. Comprehensive 670+ Hourprogram with 24*7 available learning-resource and dedicated doubt sessions for better learning experience and Best infrastructure. Program designed with meticulous & in-depth subjective approach with unique pedagogy. These are the full length programs for the GATE Aspirants which are looking for classroom coaching program for their exams. These classes are schedule in such a way, so that it keeps running over the time of 1-2 month, when classes are facilitated 2-4 days in a week contributing 4 hours well ordered. Our Postal Guidance Program is the next best thing one can get if can't personally be present at the Academy. The course material is systematically compiled in a student-friendly manner so that students can avail benefits from our expert guidance. These days most of the exams are being conducted online and students are bound to appear in these exams like GATE and JAM only. We at dips academy are having one of the best online test platforms in India. A Doubt Based Learning Approach that set us apart from the others.This is the reason you will find DIPSian everywhere. You name any IIT, NIT or any research body, you will find one at least. Recorded Live-classroom videos which maintain the classroom rhythm and mood even when you watch it from the comfort of your home on any device. Dedicated pool of faculty is available to address the doubt of students. Tips and Tricks is discussed in the doubt session to solve the questions and it is the great source of time and stress management during the real exam. R&D team contribute in student success dominantly, because updated content, set of questions, assignments and adopting in teaching new content helps student to be ahead from others. 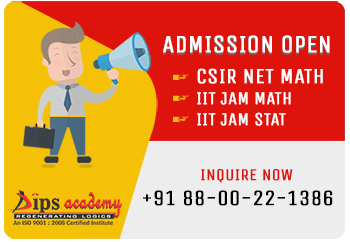 Students get opportunity to analyze their strength in solving questions on difficulty parameter as the nature of question varies from exam to exam, student gets performance basis easy questions, medium questions and tough questions. 25 Years of success Journey. Achieved various milestone. DIPSians are everywhere, pick any IIT or research institution, you will find one for sure. At DIPS, cracking the exam is the habit of DIPS student, but we conditioned them to be Mathematician. A. Awarded as best Institute. B. Awarded for Best Mentor. C.	Highest result Producing Institute. Making the organisation success and at the same time making student success by turning their dream true is something bigger than mere leadership. Behind our leadership, there is mentor and industry leader who are continuously working on making the standard of next-level and student satisfaction. Chairperson massage holds the vision of the organisation and future path of growth which ensures all stake-holders’ (Students, Staff, Faculty, even Parents) satisfaction and individual growth. For us, student’s individual growth is when he pass the exam and ready to embrace new life. At the other end, parent’s growth is when their offspring growth ensured. Generally leadership is the key reason of success or failure of any organisation. But when making the organisation success and at the same time making student success by turning their dream true is something bigger than mere leadership. Such dual leadership is being played continuously & dedicatedly by founding member and Director Mr. Rajendra Dubey, under his visionary mentorship, DIPS Academy has been flourished & reached to such height. 1. Mr Rajendra Dubey, a seasoned mentor for mathematics and entrepreneur, with a vast teaching experience of more than 25 years in the field of Mathematics. He is a true learner and keen observer endowed with GOD gifted qualities, of humor, presence of mind, wittiness and graced with natural talent of teaching. He focuses on holistic metamorphosis there by enriching the cognitive skills of the students from HOW THINGS WORK to WHY THINGS WORK. This is the reason he is the most popular and sought after mentor, therefor students call them ‘Dubey sir’ with love, which in-return become a very popular searched keyword on google search engine. 2. Jyoti R Dubey, is the second director of the organisation and playing a very important key role by connecting the students with their right mentor. Being a wonderful mother and wife, she is empowered women with multitalented traits. She is the head of Top Management Committee and her leadership span from small issue of students to top management decisions. Her effort is to evolve a congenial environment where students, faculty members, parents and non-teaching staff put effort together for their individual goal so that everybody of the ecosystem get benefited out of it. She is passionate and dynamic in her approach and quick decision maker that makes her very adorable among the organisation. Her ability of detailing and eagle-eye style of working is her another leadership quality that set her above from others. I am very thankful to Dubey sir and all faculties for their valuable guidance. Because of their guidance I could clear GATE as well as JRF in the FIRST attempt. I got the clarity of definitions and hence I could understand the topics and could use the proper results at proper questions. My experience with Dips Academy was great. I am very graceful to Dubey sir and entire faculty for their guidance and teachings. The teachings of Dubey sir about life and education will always remain with me and motivate me in my life. Also, the study material provided by Dips academy is very appropriate and helps us in our preparation and the video lecture faculty helps us to understand our subject better if the class is missed which according to me is a very helpful. I am very glad that I have cracked JRF with the help of Dubey sir. He is an amazing mentor and a very humble person. Dips Academy has a lot of contribution in my success. I am very much thankful to the whole team of Dips. My experience here was great and the study material and video lectures were also every helpful to me. © 2018 Dipsacademy. All Rights Reserved..